Note that the University of Toronto stopped their distribution of these practice examinations in 1996. The last year for which these practice exams are available is 1995. One can also find reviews and examination question books in the Kellogg Library by doing a Medical Subject Heading (MeSH) search in the Novanet catalogue: e.g. 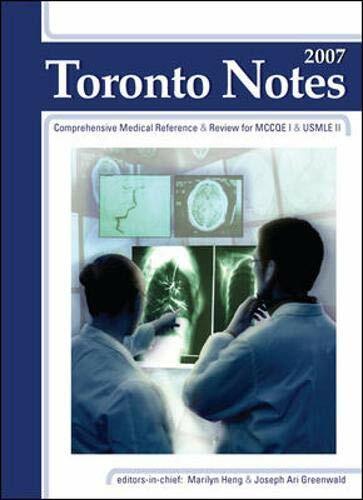 The Toronto notes : a comprehensive medical review textbook for the Medical Council of Canada qualifying exam. by Andrea Molckovsky et al. Latest edition kept on reserve, older additions in the stacks. The following textbooks may be used by MCC test committees to validate examination questions. Visit the Medical Council of Canada (MCC) web site for more information on writing the Qualifying Examinations, parts I and II. Has a self-assessments section with multiple choice exam questions. This review tool helps you master both Basic Science and Clinical Medicine to make USMLE Step 1, Step 2 and Step 3.